Here is a great new offer that we have for you. 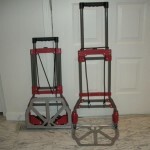 We have 2800 of these fold up hand carts. These are new, first quality. This quantity makes a full truckload. The reason for this special deal. The factory that made them forgot to put their customers labels on the units. Result…you get a super bargain. 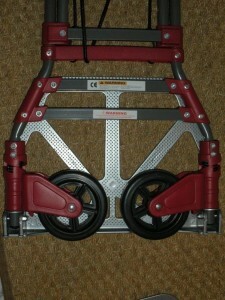 We understand that these are 250 pound capacity with heavy duty wheels. Usual retail that we have been able to research is in the $45 to $60 range. Bulk packed on pallets. No tags or bar codes. Minimum order 1000 $14.00 each. Sample available.